My focus remains on women’s health encouraging fitness from the inside out. Because I believe that true, long-lasting fitness begins from within. Getting fit takes more than a set of dumbbells and insane amounts of sweat…although that helps. However, being fit is just that: being. Lifestyle. It has to resonate from your very core first. You have to believe in YOU! Sometimes having that someone in your life believe in you when you can’t…yet…is the first step in becoming truly fit. At Pink Payne Fitness, you can depend on my enthusiasm and motivation to get you the results you’re looking for. As a certified personal trainer and endurance athlete I have the experience and knowledge needed to teach and motivate YOU! The fitness industry has evolved traditional aerobics to include an array of diverse fitness programs. Understanding effective communication, teaching techniques and motivational skills enables me, your NASM-certified personal trainer, to successfully develop and implement safe and effective exercise, fitness, and/or running programs for Pink Payne Fitness clients. Plus, I will always work hard engaging YOU by using my personal passion, creativity and enthusiasm. I will always offer a FREE 30 minute initial consultation. No gimmicks. No strings. No products. Just you and me talking it out to see if I’m the right match for your needs! I can create running and racing programs, general fitness plans, and/or whatever your heart desires. Before deciding to jump the gun and purchase shoot me an e-mail for an example of what my online training looks like! I’d be happy to give you a preview before you purchase. I will immediately get to work on YOUR personalized training and weekly e-mails are sent out on Fridays. Bi-weekly e-mails Wednesday and Fridays. I am also available for one-on-one training if you’re local to the western NC area. Just send me a message through my Let’s Connect page to get started. 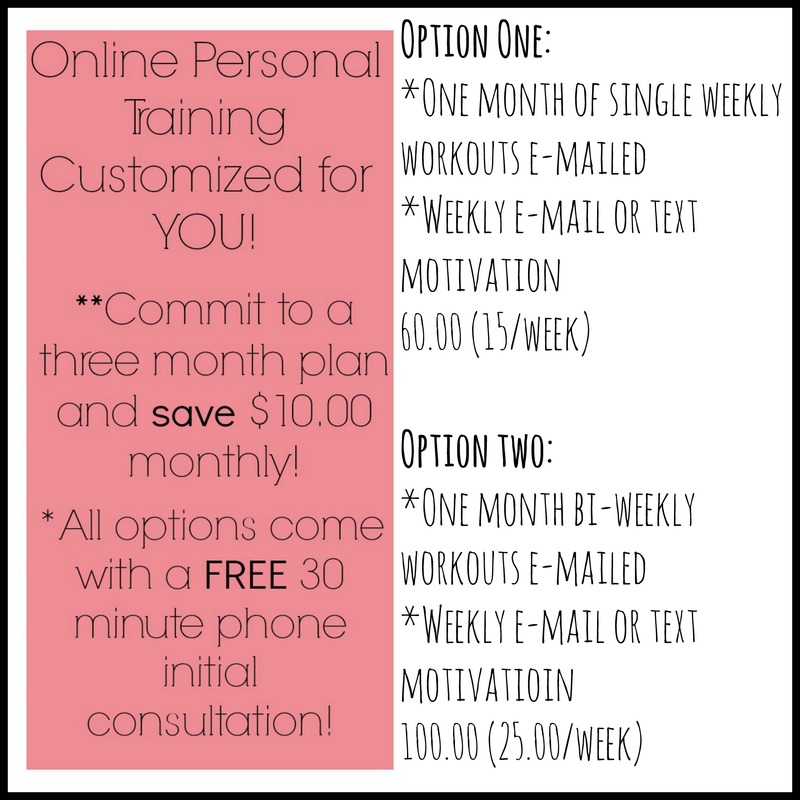 Sign Up for YOUR personalized training! My online training system is still a work in progress so bear with me as I work out all the kinks and systems. Sign up HERE for weekly Fit Tips from Jess! “Jessica is one of the most inspiring motivating people I know. I have had the pleasure of working with her for a couple of months now and she has taken me from a couch potato to loving to run and work out. I am down almost 20lb and I love getting out and running and doing the challenging workouts she sets up for me. Looking forward to accomplishing more goals with Jessica as my personal trainer. Its a blessing to have met her.” -Candie B. While I am a certified personal trainer it is always best to seek your physician first before starting any fitness program. You are responsible for your health! This website’s content is not a substitute for direct, personal, professional medical care and diagnosis. None of the exercise program’s from Pink Payne Fit should be performed or otherwise used without clearance from your physician or health care provider first. The information contained within is not intended to provide specific physical or mental health advice, or any other advice whatsoever, for any individual or company and should not be relied upon in that regard. I am not a medical professional and nothing on this website should be misconstrued to mean otherwise. As with any exercise program you assume certain risks to your health and safety. Any form of exercise program can cause injuries, and Pink Payne Fit is no exception. It is possible that you may become injured doing the exercises in your program, especially if they are done with poor form. If you choose to participate in these risks, you do so of your own free will and accord, knowingly and voluntarily assuming all risks associated with such exercise activities. These risks may also exist for those who are currently in good health right now. Jessica Payne is not a medical doctor. Her advice whether it be on her website, exercise program’s or via his email coaching, none of it is meant as a substitute for medical advice. You must consult your doctor before beginning ANY exercise program, no exceptions. You are using Jessica’s plans, program’s, workout’s and coaching at your own risk and Pink Payne Fit is not responsible for any injuries or health problems you may experience or even death as a result of using Pink Payne Fit.